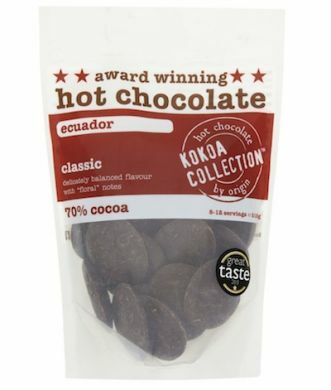 Kokoa Collection Ecuadorian hot chocolate tablets. For many connoisseurs Ecuador produces the best chocolate in the world. We have selected their wonderful Arriba Nacional beans for our hot chocolate. 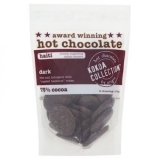 At 70 per cent it is a perfectly balanced bittersweet where the two flavours (floral and herbal) meet giving a delightful hot chocolate recognised by the Great Taste Awards. Ecuador is one of the newly emerging democracies fighting off corrupt leaders and military dictatorships imposed by the Americans. It is led by Rafael Correa who led the country away from being a basket case easily exploited by American banks and food corporations to one where millions now have good education & healthcare and poverty is being completely eradicated. I then moved on to the Ecuador 70% which was AWESOME. It was everything I love in an Arriba Nacional bean and yet it was a hot chocolate. There was a delightful intense fruit washing through my palette and yet something more woody and herbal was struggling through where usually it would be overwhelmed by the chocolate. Cocoa paste Ecuador, sugar, cocoa butter, emulsifier: soya lecithin, min. cocoa content: 70%.